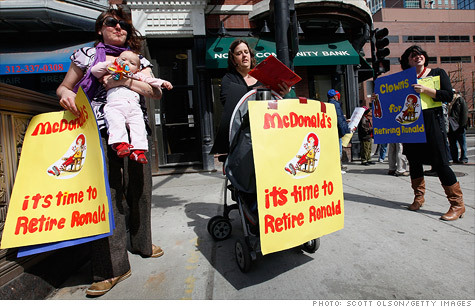 Junk food foes to McDonald's: Retire Ronald! Protestors in Chicago urge pedestrians to support calling for McDonald's to retire Ronald McDonald, claiming the mascot markets unhealthy food to children that leads to childhood obesity. NEW YORK (CNNMoney) -- Ronald McDonald, the orange and white face of the popular fast-food chain that bears his name, is under attack by nutrition advocates who want him to be retired. Their beef, so to speak, is that McDonald's uses clowns and toys to sell unhealthy food to impressionable children. The company argues that its marketing practices are responsible, and that its food is "high quality." The push to retire Ronald is being led by a group called Corporate Accountability International, which plans to introduce a resolution calling for the clown's ouster at the company's annual shareholder meeting Thursday. "Through this initiative, the public health community is rallying behind a simple message to McDonald's: stop making the next generation sick -- retire Ronald and the rest of your junk food marketing to kids," said Steven Rothschild, a professor at Rush Medical College and a backer of the resolution. McDonald's is already being sued by a group of consumers and health care professionals over the toys that come in the Happy Meals marketed to kids. The group filed a class action suit late last year in California that claims the company's marketing practices violate state's consumer protection laws. In addition, a group of Philadelphia nuns filed a proxy resolution in March asking McDonald's to investigate its "policy response" to concerns about the link between fast food and childhood obesity. McDonalds stands by Ronald and says that it is committed to children's health and nutrition. "We are committed to responsible advertising and take our communications to children very seriously," McDonald's said in a statement. The company has argued that it has introduced healthy alternatives such as Apple Dippers and low-fat milk in Happy Meals. But critics say the company still serves French fries in the vast majority of its kid-friendly combo meals. McDonald's (MCD, Fortune 500) also stressed that Ronald is the symbol of its flag-ship charity, Ronald McDonald house, which is dedicated to the health and well being of children. "Ronald is an ambassador for good and delivers important messages to kids on safety, literacy and balanced, active lifestyles," the statement said. Ronald McDonald, one of the world's most recognizable clowns, has been the company's mascot since 1971. He was joined shortly there after by a cast of imaginary characters including the Hamburglar, Grimace, Mayor McCheese and Captain Crook.